The image is symbolic of our CIRCLE OF LOVE program. By definition, a circle is a curved line with every point equal distance from the point of the center and bound together by the common interest. The seven point program of the CIRCLE OF LOVE is bound together by the common interest- LOVE. 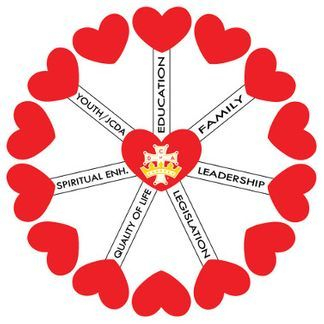 The "CIRCLE OF LOVE " program portions of this Web site are gathered to assist Catholic Daughters in working with the Church and community. We are indeed very aware of the needs in society that are deeply affecting today's generation, the elderly, and human life. To be effective in promoting good works, we must reach out and make a difference in the lives of those who are suffering, whether it be through their own fault or the circumstances in which they find themselves. If we are to be "Jesus hands and feet" as is pledged in the Act of Consecration during the Installation Ceremony, then we must use the talents He gave us, become educated in new fields, volunteer our services and financial assistance where needed. CDA strives to embrace the principle of faith, working through love in the promotion of justice, equality and the advancement of human rights and human dignity for all. Members are encouraged to develop leadership skills, dedication and great enthusiasm for the work of Christ and His Church. Answer our Lord's call with faith, generosity and love by joining the Catholic Daughters of the Americas.